The program starts with the attending physician who sees the patient on the initial visit. He or she earmarks the patient for callback. There are no hard-and-fast criteria for who is added to the callback list, but most patients either don't have a cut-and-dried diagnosis, or made the doctor concerned about adequate follow-up or pain control at home. Determining who makes the calls is usually a choice between in-house and out-sourced systems. In-house systems have the benefits of ready access to patient records, faster access to members of the patient’s treatment team, quicker referrals to in-hospital providers, and brand reinforcement. Shortcomings of in-house systems include lack of adequate staffing, the need for job-specific training, and possible conflicts-of-interest between personnel who may be working together. Out-sourced programs have the ability to run day or night, avoid draining hospital personnel resources, utilize employees who are specifically trained for the task, and have systems in place to quickly synthesize the collected data. Out-sourced systems have greater cost, utilize personnel who are not familiar with the hospital or care system, and bear the burdens that come with sharing confidential patient information with a third party. At our institution the call-back system is run by an in-house group that is tangentially involved in ED operations, but no ED physicians make calls themselves. The calls focus on three questions: did the doctor listen effectively, did the doctor explain treatment, and did the doctor address concerns? Each answer is given a numerical score. The patient is also given the opportunity to express problems such as worsening symptoms, inability to obtain prescriptions, etc. The two benefits that I see from this program are improved patient care and improved patient satisfaction. From a care standpoint, the follow-up calls are an opportunity to re-address a complaint if the working diagnosis and treatment appear incorrect. Try as we might, our diagnostic and clinical abilities are not perfect. 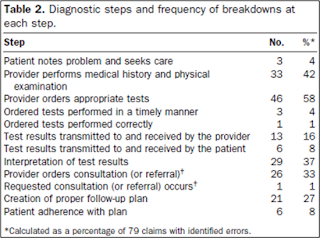 A 2007 study of missed/delayed diagnoses showed myriad causes — many of which are beyond the control of the doctor or require proper follow-up and compliance on the part of the patient. 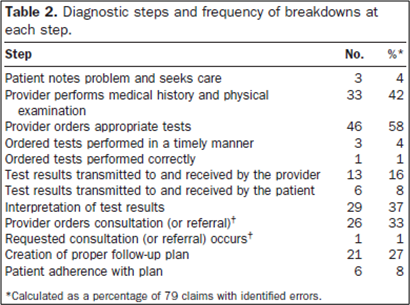 A call-back program gives us another bite at the apple, another opportunity to properly diagnose and care for our patients, and one last chance to avoid breakdowns in the chain of diagnostic steps listed in the table,1 compiled from 79 malpractice suits in which an error could be identified. Patient satisfaction is addressed in two ways. 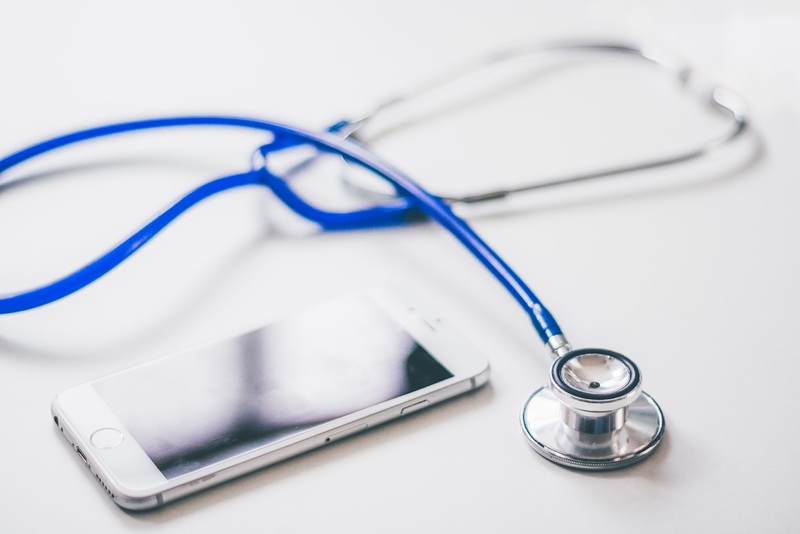 First, the call-back enables patients to directly rate their physicians, thereby alerting a practice to a physician who may be perceived as uncaring or detached. Second, it shows patients that we continue to care about their health even after they have left the ED. The hope is that more satisfied patients are more willing to follow the advice of their ED doctor/nurse, and are less likely to pursue punitive measures if they are displeased with the level of service they obtained. The pros of such a program become obvious with every missed diagnosis that is caught. It is hoped that the program will reduce malpractice suits and earn the ED a reputation for caring about the members of its community. The cons lie in some of the rougher edges of the program, which may be smoothed over time. A large percentage of patients on our call-back list cannot be reached, either because they gave incorrect demographic information or chose never to return phone messages. Potential for bias in selecting patients for call-back could be mitigated by relying on diagnosis, rather than attending physician choice. As discussed in my last editorial, we live in a world where we doctors often play the role of salesmen: selling ourselves as competent professionals, selling our recommendations as credible avenues toward better health, and selling ourselves as caring and active members of the community in which we practice. A call-back program is one method for reaching out to our customer-patients, in the hope that more dialogue will lead to better health and greater satisfaction on both sides of the health care system. Thanks to Thomas Kurtz, Associated Hospital Director of Emergency Services, Logistics, and Specialty Care Transport at Temple University Hospital, who provided me with information and research sources about the call-back program which he helped implement at our hospital. Kachalla A, et al. Missed and delayed diagnoses in the emergency department: a study of closed malpractice claims from 4 liability insurers. Ann Emerg Med. 2007;49:196-205. Nunez S, et al. Unscheduled returns to the emergency department: an outcome of medical errors? Qual Safe Health Care. 2006;15:102-108. Williard M. Post-discharge call programs – improving satisfaction and safety. Patient Safety and Quality Healthcare. 2010:36-39.